March 5 University of BC Triathlon: S800m(15:21) B23km(45:20) R7km(29:01) = 1:29:42 7th out of 19 Age Group. My first triathlon since August 2, 1992! Time flys when your looking forward to having fun. May 1 Comox Valley Triathlon: S750m (14:29) B20km (33:19) R5km (22:37) = 1:13:03 4th in my age group. Yes, beer can slow you down! May 24-25 Island Farms Vancouver Island Road Relay. Year two for me and a slightly different team. June 5 Panorama Classic Triathlon: S500m (9:23), B30km (55:00) R8km (32:00)=1:36:23 Second in 35-39 Age Division. July 1 8-40-8 Duathlon in Langley, BC R8km (31:58) B40km (1:12:39) R8km (32:11)=2:16:48 Third masters finisher/Seventeenth overall. 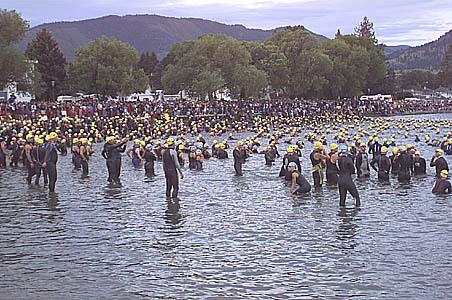 July 21 Tiger Triathlon: S1500m B40km R10km Colville, Washington. October 9 Royal Victoria Marathon (3:18:00) 7:33 pace for 26.2 miles. Greg Welsh wins the Ironman World Championship and in doing so becomes the first non-American male to win the big one! Training had intensified in 1994 and by the end of that year I felt very fit. My running was the best I've ever run, my cycling was very good and my swimming was at least at par. March 11 University of BC Duathlon: R4km (15:00) B23km (37:32) R4km (16:36) = 1:09:08 1st place in Masters Category 13th overall. Caught a bad cold and couldn't race until April 30, but I lost some speed. It's hard to maintain top fitness and race your best for a long period of time. April 30 Paper Chase 10km (38:59) Still recovering from a cold. Finished the Island Series 5th 40-44 Age Group, hard work paid off. May 20 & 21 Island Farms Vancouver Island Relay! 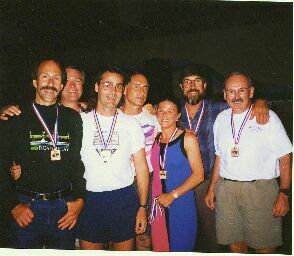 June 4 Panorama Classic Triathlon: Decided to do a team effort with Tim Benetti. He swam and ran, I did the bike portion. Smething different and I didn't have to swim (not my favorite). June 11 Triathlon for Healing: Another team effort, Ron Green Swim 800m, I did the bike 22km and Shelly Sarakanas Ran 5km. We got third place in the mixed division. July 9 The Island Man half-ironman (Team Relay) Elaine Sutherland swam 1.9km, I rode 90.1km and Stephanie Wood Ran 21km trail run. We came 5th out of 30 in the team category. Slowest year since I started training in 1988. Burnout and changing jobs had alot to do with the slow season. January 12 Harriers 8km Run 32:39 My 8th Pioneer/Harriers 8km. Always a good indication on speed. February 9 Cedar 15km Run 1:02:39 My 7th Cedar 15km. February 23 Dallas Road 10km 40:22 Finally felt good in this race series. March 23 UVic 5km Run 19:38 Ouch, I hate these short, fast runs. May 11 Bazan Bay 8km 31:56 A hot day, should have drank much more water. Ended up 9th in the Mens 40-44 A/G for the Series. May 25 BC Duathlon Championship, Sannichton, BC Run 5km Bike 30km Run 5km = 1:45:50. A very hilly bike, but happy with my run splits. This race determined slots for the BC duathlon team so the competition was tough! I was really just participating to get back into shape. June 1 Panorama Classic Triathlon Swim 500m (10:02), Bike 30km (57:36), Run 8km (32:09) = 1:39:47. 4/13 A/G. Seventh time I've done this race. June 8 Triathlon for Healing Swim 800m (16:50), Bike 20km (40:23), Run 5km (20:51) = 1:18:04 6/17 A/G. Won the big draw prize - a mountain bike! 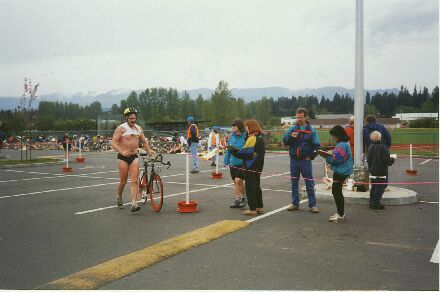 June 15 Qualicum Beach Triathlon Swim 400m (7:32), Bike 18km (32:56), Run 5km (20:59) = 1:01:27 1/8 A/G, 4th overall individual. August 24 Ironman Canada Triathlon, Penticton, BC 2.4 mile swim, 112 mile bike, 26.2 mile run/walk = 14:25:06 The wettest IMC on record. Someday I'll race this under 12 hours. Note: In June of this year I began working weekends and odd days throughout the week which really screwed up my training and especially my racing. I stopped working weekends November 1998. March 21 UBC Duathlon Run 4km (16:19), Bike 23km (41:16), Run 4km (18:30) = 1:16:05 3/10 A/G. Now this was a slow year! A knee injury in January 1999 kept me from running for nine months. Jennifer, swim 800m (12:58); Glen, bike 20K (41:27); Gregg, run 5K (21:58) total= 1:16:23 good for 35th overall and 5 out of 16 mixed team. This summer plan to participate and train for a few triathlons and the Royal Victoria marathon.